My Thoughts on Kindle Unlimited. I am a huge fan of Amazon.com. I constantly shop on Amazon, I buy the majority of my books and music on Amazon. I rent movies on Amazon. I've even upgraded every year that a new Kindle Fire device is released. (Since 2011). I was pretty excited to find out about Kindle Unlimited. 600,000 titles free to read, including audio books for $9.99 a month. Sort of like the 'Netflix' of books. Amazon includes a 30 day free trial so you can test drive Kindle Unlimited, so I decided to take the plunge. Tip: You can download the Amazon Kindle App free on pretty much any mobile device, so you don't actually need a Kindle to use this service. 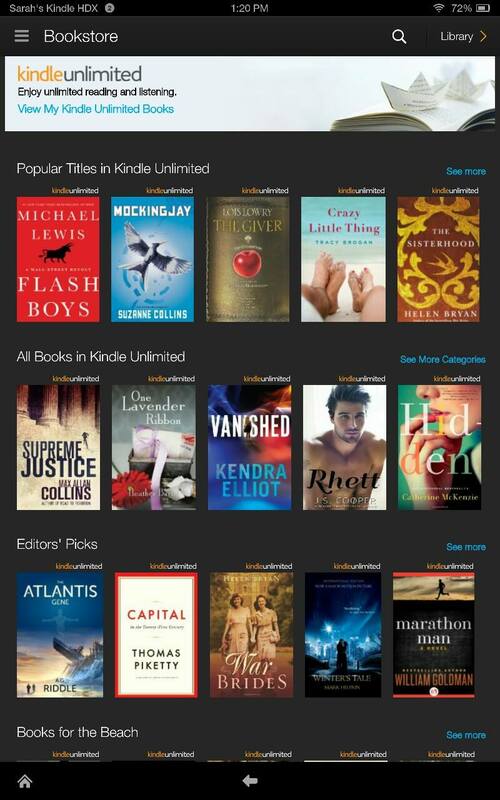 Navigating Kindle Unlimited: From your Kindle you go to the store, and there's an option called 'Kindle Unlimited' that will show you all the titles listed under your Kindle Unlimited membership. I'm a book addict and I read almost everything, though my favorite categories are; biographies and memoirs, history, books about holocaust survivors, Tudor period history/historical fiction, and a few fiction books. I do like that you are allowed to hold 10 titles at any time. That's more than the e-library allows me to check out at once. But... I just found the Kindle Unlimited selection kind of "meh". I am mostly seeing lower priced independent books, interspersed with a few best sellers. And... the majority of books I'm seeing, I already own! (I check a few times a week for free books on Amazon). 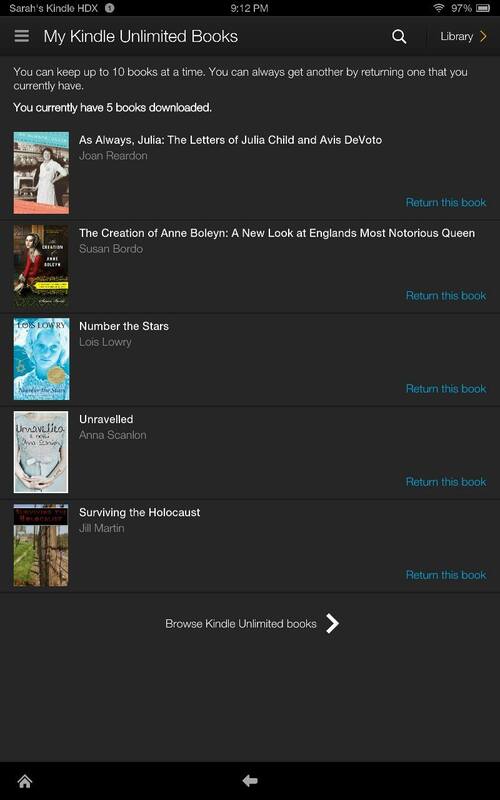 To be completely honest, the Philadelphia e-library has a better selection than Kindle Unlimited! (I wanted to add, I do like a lot independently published books, but with Amazon.com being the leader of e-books on the market, I thought the ratio of independent vs. mainstream would be more balanced). Books I found to read through Kindle Unlimited. Now... I know Kindle Unlimited is just getting started, and it's fairly new; so hopefully down the road they will add more mainstream books to balance out all the independent titles featured. It would be nice in the future if they offer perks like getting to read titles before they are released to the public, etc. I'm sure a lot of it also depends on licensing they've obtained from the publishers. But I hope to see a better selection down the road. All in all I'm not impressed with Kindle Unlimited at this time, and will be cancelling my trial before the 30 days. You will see three tabs: Your Content, Your Devices, and Settings. Click on: Settings. Below you'll see the option to cancel your Kindle Unlimited membership. All in all... I just found Kindle Unlimited... too limited.